State Rep. John Byrnes (R-Osage) has frequently touted his ability to win as a Republican in a district that has a distinct electoral advantage for Democrats. And now, it appears, he wants his colleagues to understand why. Last week, during an exchange with Jeff Moorman of Iowa for Student Achievement in which he defended Gov. Terry Branstad’s anti-bullying bill that is currently stalled in the House of Representatives, Byrnes suggested homeschool families shouldn’t have any say to legislators on issues regarding public school education. The response resulted in outrage from conservatives and homeschool families throughout the state. Also as a result of the original conversation, Moorman sent an email to all House Republicans, continuing to urge them not to vote on the anti-bullying bill, and to express his disappointment in Byrnes’ comments. In reply, Byrnes appears to provide a backhanded apology for the comments, suggesting Moorman was only interested in making headlines, and then declared his support for the anti-bullying bill, as well as for Common Core State Standards. The text of Moorman’s email, provided to The Iowa Statesman, follows. This weekend I sent an email to the Republican House Leadership and all Members of the Republican caucus regarding my visit with Linda Fandel addressing parents concerns about the anti-bullying bill. What initially began as an email seeking support from House Republicans to stop the Governor’s anti-bullying bill resulted in an unfortunate and revealing comment by Rep. Josh Byrnes. I am deeply troubled by Rep. Byrnes’ belief that over 10,000 taxpaying Iowa homeschool parents should not have an equal voice regarding education in Iowa. Doesn’t Rep. Brynes realize that these parents are as concerned about this anti-bullying bill because they understand how it will also impact their children? In addition, given his statement above, does he also believes that unless an Iowan has children in public school currently, they should also have no voice? Do you believe that? Unfortunately, the anti-bully bill is just an example of the types of education laws and policies that drive most parents to the safe haven of homeschooling in the first place. Instead of taking the position that parents who homeschool are irrelevant, legislators like Rep. Byrnes should embrace these parents, involve them in the public education discussion, and inquire as to why they are leaving public education in favor of homeschooling. On behalf of Iowa parents, I respectfully ask House Republicans to stand with us regardless of where our children go to school, and reject the Governor’s deceptively named Anti-Bullying bill once and for all! The text of Byrnes’ rebuttal email to members of the House Republican Caucus, also provided to The Iowa Statesman, follows. I have apologized for these comments. As you can see from this email, this individual loves controversy and to stir the pot. Again, I apologized for my comments and have no idea who this person is. I try to respond too all who reach out to me as I feel they deserve a response. This was a person who didn’t just want a response but also wanted a sound bite. I am in favor of the anti-bullying legislation and I support the common core. I am a public school person and I was caught in a moment where my frustration level was elevated. My apologies. 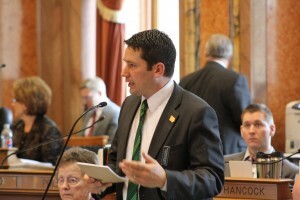 Following his role in the passage of Senate File 257, which raised Iowa’s motor fuel tax by more than 40 percent, an effort was already underway in House District 51 to find a primary challenger for Byrnes in the 2016 election. There is little doubt these new comments will provide new energy for that effort.